Johnny Vegas is the most recent of the three variations people use to approach Solar Slab above. It was somehow overlooked for years despite its excellent moderate climbing. On its own it is a fun climb on steep juggy rock, and in combination with Solar Slab and/or Going Nuts, is one of the longest and best 5.6 routes anywhere. Which SuperTopo guidebooks include a topo for Johnny Vegas? FA: Harrison Shull, Tom Cecil, Dave Cox, Todd Hewitt, 11/94. 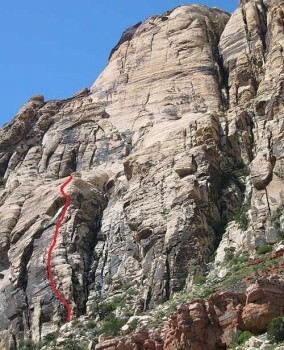 Lines are common on this climb, and if you want to climb all of Solar Slab and descend before dark, a very early start is recommended. The Loop Road opens at 6 a.m.—the slightly longer hike from Highway 159 at the old Oak Creek Campground is the best way to beat the crowds.